bebop spoken here: Jam Session @ the Dun Cow, Jesmond - April 11. As I walked down the not so mean streets of Jesmond I reflected upon past evenings of fine dining and equally fine music at the Cherry Tree Restaurant. Well, the Cherry Tree name is no longer and nor is it a jazz venue but, I'm pleased to report, Jesmond is not without jazz if the Wednesday sessions at the Dun Cow take off. Tonight was the inaugural one, a jam session that, appropriately featured several of the Cherry Tree's regular performers including tonight's house trio i.e. Messrs Edis, Grainger and Morgan who got things going with You'd be so Nice to Come Home to and Toots Thielemans' delightful jazz waltz, Bluesette. Soon musical instrument cases began to arrive, slung across the broad backs and, sometimes, thick skins of jamming jazzers. First up were Ray Johnson and Simon Probyn. The flugelhorn/tenor sax duo had form having performed admirably at the Jazz Café jams and, in Johnson's case, at the Take it to the Bridge workshops which also take place on Wednesdays, across town, at The Globe. Yardbird Suite and Yesterdays came to no harm and the benchmark had been set. Julija can handle a tune, in fact, she takes it by the scruff of the neck and extracts its very innards leaving singer and audience breathless. Cry me a River and There Will Never be Another You were given the works and the crowd loved it! Another paint stripper is Paul Ruddick who hit the spot with virile versions of The Night Has a Thousand Eyes and All the Things You Are. Some fancy drumming from Morgan during this set. Time for youth to take the stand with Early Birders Metcalf and Lawrence on flugel and piano for Stella by Starlight and On Green Dolphin Street. Soon they will be off to uni but not as music students which is a shame. However, I'm sure that when they are not doing whatever they become qualified to do jazz will still be a part of their lives. More flugel, this time from bossman Graham Hardy in tandem with Stuart Davies on a Gibson 335. Hang on to your Gibsons, they may soon be collector's items. The pair shone incandescently on Work Song and Nostalgia in Times Square. Hardy stayed on board for a flugel/trombone pairing with Chris Gurgi-Smith (on leave from the Customs House Big Band who, incidentally, can be heard on Friday, April 13, at the Everyman Theatre in Spennymoor. Details in RH column.) Gurgi-Smith and Hardy sounded good on So What? (or was it All Blues?) and we look forward to hearing the trombonist again in a small group setting. Alice Grace, no less, turned up and obliged with a request for A Weaver of Dreams followed by Dindi and Someday my Prince Will Come. The girl did good but, doesn't she always? There was more to come. I spotted Ben Richardson and Harry Still approaching the starting gate but, alas, three days of GIJF were belatedly catching up with me and I headed home for an early night which doesn't explain why I'm typing this at half an hour past midnight! Still, it had been a good night. Let's hope future sessions pull in a few more punters other than the musicians. 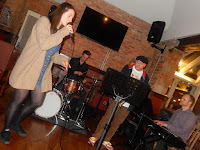 Next week, Julija returns for a duo set with Alan Law which should be good. PS: It goes without saying Edis, Grainger and Morgan did the business.